That sounds like a place of comfort, a place where mutual support exists. I guess what stirred me was that it seems so different than America does today. We’ve seen times like that in our neighborhood and that I am very grateful for but I wish it was more often and everywhere. The word this week is COMFORT. Community brings that. Christian community can certainly enhance that. David in Psalm 23 says, yea though I walk through the valley of the shadow of death I will fear no evil for thou art with me, thy rod and staff – they comfort me. Hmm. It must mean more than mere discipline or help from falling off a cliff? The word for rod is sebet. It means walking stick which can be used to count and protect sheep – I want to be in that number! It feels sooo good to be CHOSEN, accepted. This large stick would ward off bears, foxes and any other predator. It could guide the sheep away from the edge of the cliff and to greener, safer pastures. That correction was meant to bless, not instill fear or injury. The shepherds crook was something to support you or to lean on. It provided relief for the shepherd who could not sit down. These tools would be used to part the sheep’s wool on their backs to check for injury or bugs so it was investigative and medicinal. The crook would allow a small lantern to hang from it so as sunset came and the shepherd walked his sheep back to the fold they would be able to see the path ahead and follow their shepherd in the dark. The tools guided and led the sheep, correcting missteps and redirecting when the sheep went astray. Their journey was not led by their desires or whims and wishes but overseen by a loving shepherd whose purpose was guiding them home. What great comfort that they could lean on his wisdom, lean on his care and trust his authority. The opposite of comfort is anxiety, irritation and distress. God’s heart for his sheep is that they be consoled, refreshed, restored and calmed. He does that by keeping us on his path rather than our own or the way of the world. That takes directive action at times but it prevents cliff hangers and falls that could prove deadly. In the moment we don’t like correction, redirection or being detained but when we see where we could have fallen, where we could have ended up- that is life giving. Comfort can be what we missed or what was provided, it is about the care of the Shepherd. Genuine is an interesting word for something that makes people act anything but genuine. I struggle to not quote the statistics that hard alcohol is present in almost all assaults. This alcohol is 100 proof which means it is 50% alcohol. I won’t get into the arguments about sipping saints as we are technically free in Christ to drink but we are also free to enter rehab, die of liver cirrhosis and free to live lives of addiction. I’ve never met anyone that could pinpoint the moment they went from recreational drinking to becoming an alcoholic. When we turn to other “comforts” (shopping, drugs, gambling, gossip) the Bible calls that idolatry and I’m not sure I want to go down that slippery slope. Thirsty can be solved in other ways and even as I write this I feel a rod of let’s go a different direction. That Shepherds crook keeps us on the straight and narrow, sober, free and able to follow the shepherd, even in the valley, even in the dark. What rod or staff is God using to hold you back from something dangerous today and are you allowing that to protect or guide you? God uses many methods to shepherd His people. His ways look like support and assistance. Back in the day there were no wheelchairs or walkers. When Joseph leaned on his staff it meant the blessing was a coming. What do we lean on for comfort? Who do we go to, to be counted and accepted? Where do we run in times of fear, darkness or trouble? Remember that cozy little town of slab fork I mentioned above? It’s on route 54 down there by the river. That town produced a singer – a psalmist like David who also sang about when we are weak we need somewhere sturdy to lean. His name is Bill Withers and he wrote the song, “Lean on me”. Some of those folk’s efforts to bring comfort to one another extended beyond their own hands and reached a nation. How are we bringing comfort to those around us and will it be comfort that lasts? When it points to us it can become idolatrous but when it points to the Shepherd it can be life sustaining. 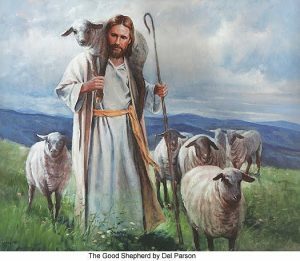 Are we like the Great Shepherd, bringing guidance and comfort? So, dear friends to quote a slab fork resident, sometimes in our lives, we all have pain, we all have sorrow, but if we are wise, we know that there’s always tomorrow. Lean on the one who is sturdy, knows the way, is the Way and wants to bring you home. We all need somebody to lean on. The best somebody is Jesus – the same yesterday, today and forever. His rod, His staff – they’ll comfort me, they’ll comfort you.